Solution: Move some messages from the mail server to your computer. Under Personal Settings, click General. Under Sidebar, clear the checkbox for Hide On My Computer folders. At the bottom of the sidebar, click Mail . In the message list, select the messages that you want to move. To select multiple items, hold down as you click the items. Drag the messages to the On My ComputerInbox folder. After you move a message to an On My Computer folder, that message is no longer available when you access your account from a different computer. Note: To keep your inbox from becoming too full, you can create rules to move or delete certain messages automatically. For example, you could create a rule to move all messages that are older than three months to an archive folder under On My Computer. To learn more about how to create rules, see Create a rule in Outlook 2016 for Mac. Solution: Export to an Outlook for Mac archive file. To specify which items you want to export, assign them to a category and then export all items in that category. In the message list, select the items you want to export. Select Message > Categorize, and then click a category. Select Items that are in the category and then choose the category you want to export. Click Continue. Enter a file name and the location where you want to save the file, and then click Save. Note: To learn how to restore information from an archive file, see Import email messages, contacts, and other items. Solution: Empty your Deleted Items folder. Press CONTROL, and then click the Trash folder > Empty Folder. Solution: Sort contacts and messages by a different field. The time that it takes for Outlook to sort items in a folder can vary, depending on the field that you want to sort by. For example, it's faster to sort contacts by name than by a custom field. Select a folder that's taking a long time to open. Click the By: list and select the column heading that you want to sort by. For Contacts, the fastest field to sort by is Name. For Mail, the fastest fields to sort by are Date Received and Subject. Solution: Use search to find your items. If sorting items takes a long time, use search to find items faster. To learn more, see Find items by doing a basic search in Outlook for Mac. Solution: Show only your incomplete tasks. The tasks list might respond faster if completed tasks are hidden. At the bottom of the sidebar, click Tasks . On the View menu, deselect Completed. Solution: Turn off logging in Outlook. Logging is a diagnostic tool primarily used by support professionals to help troubleshoot Outlook issues. 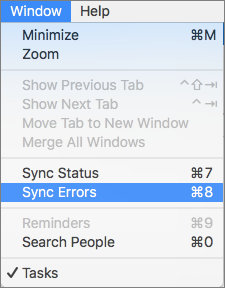 Select Window > Sync Errors. Click the Action button . Clear the Turn on logging for troubleshooting check box. Solution: Move some IMAP or Microsoft Exchange account messages from the mail server to your computer. Under Personal Settings, click General . Under Folder list, clear the check boxes for Group similar folders, such as Inboxes, from different accounts and Hide On My Computer folders. Note: When you clear the Group similar folders, such as Inboxes, from different accounts check box, you are turning off the unified inbox. 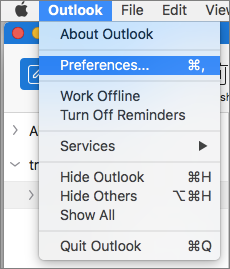 Turning off this feature simplifies this procedure, but does not make Outlook run faster. You can turn this feature back on after you have completed all the steps in this procedure. On the Home tab, click Move, and then click Choose Folder. Start typing the name of the destination folder. When the folder that you want appears, click the folder, and then click Move. After completing this procedure, you might want to turn on the unified inbox, which was turned off in step 3. After you move a message to a folder on your computer, that message is no longer available when you access your account from a different computer. To keep your inbox from becoming too full, you can create rules to move or delete certain messages automatically. For example, you could create a rule to move all messages that are older than three months to an archive folder under On My Computer. To learn more about how to create rules, see Create a rule or edit a rule in Outlook for Mac 2011. You can also copy a whole folder of messages by dragging the folder from an IMAP or Microsoft Exchange account to On My Computer. After you copy the folder to On My Computer, you can delete the original folder. Solution: Export items as an Outlook for Mac data file. You can export items that you do not access regularly but that you do not want to delete. To specify which items you want to export, you can assign them to a category, and then you can export all items in that category. On the Home tab, click Categorize, and then click a category. Tip: To create a new category, click Categorize, click Add New, and then type a category name, such as Archive. Repeat steps 2 and 3 for any other items that you want to export, such as in other folders or other item types. Click Items that are in the category, click the category you want to export, and then click the right arrow at the bottom of the screen. Click Yes, delete items after they are exported, and then click the right arrow. Note: To learn how to restore information from a data file, see Import information into Outlook. In the folder list, hold down CONTROL , click the Deleted Items folder, and then click Empty Folder. The time that it takes for Outlook to sort items in a folder can vary, depending on the field that you want to sort by. For example, it is faster to sort contacts by name than by a custom field. In the folder list, click a folder that is taking a long time to open. Click the column heading that you want to sort by. Tip: For contacts, the fastest field to sort by is Name. For messages, the fastest fields to sort by are Date Received and Subject. If sorting items takes a long time, search might help you find the items faster. To learn more, see Find items in Outlook by doing a basic search. The tasks list may respond faster if completed tasks are hidden. At the bottom of the navigation pane, click Tasks . On the Home tab, clear the Completed check box. Cause: Outlook might run more slowly if logging is turned on. Logging is a diagnostic tool primarily used by support professionals to help troubleshoot Outlook issues. By default, logging is turned off, but if you have turned it on and no longer need it, you can turn it off.